Search and rescue missions are continuing, and there are fears the death toll could rise above 100, said Itogon's mayor, Victorio Palangdan. How has China been affected? Typhoon Mangkhut made landfall on the Chinese coast near Jiangmen city on Sunday afternoon. Officials put the number of injured in Hong Kong at more than 200. Despite avoiding a direct hit, winds there reached more than 110mph and as water levels surged by almost 3.5m (12ft) in places. Authorities had issued their maximum alert, warning residents to stay indoors and away from windows to avoid flying debris. Most shops and public services were shut, and about 900 flights were cancelled at Hong Kong International Airport. A resident living in a high-rise in the city told Reuters news agency she could feel her building swaying in the storm. "It swayed for quite a long time, at least two hours," Elaine Wong said. "It made me feel so dizzy." In neighbouring Macau, for the first time in its history, the territory's famous casinos were ordered to close. The storm ploughed across the main Philippine island of Luzon over the weekend. Most of the deaths there were caused by landslides, government officials say. Dozens of people are still missing after the storm, which is being called Ompong locally. In the mining town of Itogon, at least 33 miners died after being buried under a landslide. 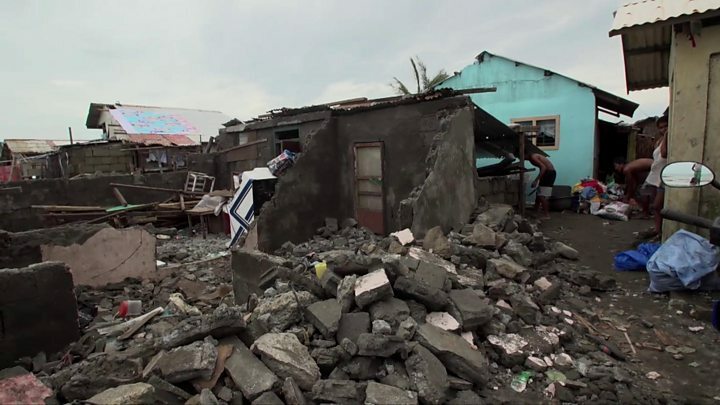 Media captionTyphoon Mangkhut has destroyed more than 750 buildings in this town in the Philippines. Itogon Mayor Victorio Palangdan told news wire AP that dozens of miners and their families had rushed into an old bunkhouse – that had been turned into a chapel – for refuge when the typhoon hit. The building was later wiped out by landslides. "They thought they were really safe there," said Mr Palangdan. The BBC's Howard Johnson in the Philippines described a trail of destruction along the northern coast of Luzon with forests ripped to shreds and electricity poles felled.